Epson TM-U230 - Impact, two-color printing, 6.4 lps, Ethernet interface. Includes power supply. Order cables separately. See accessories. Color: Dark gray. High-quality impact printer specially designed for kitchen environments. The Epson TM-U230 single-station impact printer is ruggedized to provide reliable, high-quality performance in kitchen environments. Built with the same high quality and reliability of the best-selling Epson TM-U200B impact printer, the TM-U230 offers fast, two-color order printing and an exceptionally durable case that stands up to harsh kitchen conditions. 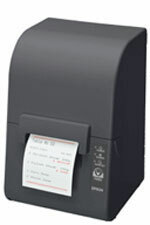 The Epson C31C391A8691 is also known as Epson POS Products	EPS-C31C391A8691	.